Where to Buy CuPro 5000, CuPro 5000 Fungicide Bactericide DF Copper Hydroxide Kocide - 3 Lb - $36.95 for Sale with Fast Free Shipping! CuPro 5000 Fungicide Bactericide DF Copper Hydroxide Kocide - 3 Lb is the advanced copper fungicide bactericide technology that delivers excellent disease control. 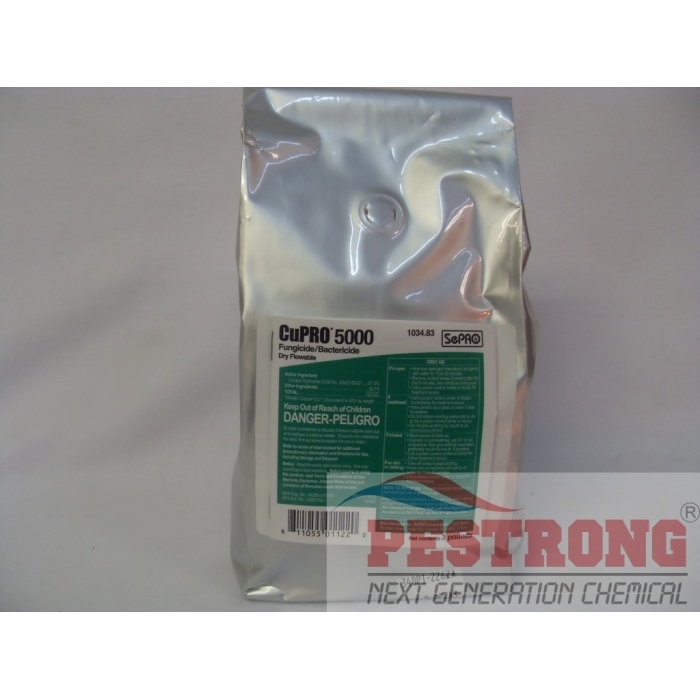 CuPro 5000 Fungicide Bactericide DF Copper Hydroxide Kocide - 3 Lb is the advanced copper fungicide bactericide technology that delivers excellent disease control with all the advantages of a dry flowable-decreased handling, dust exposure, packaging and loading time. It is Formerly Kocide 2000 T/N/O Fungicide Bactericide. Diseases Controlled+: Alterneria Blight, Anthracnose, Phomopsis, Bacterial Leaf Spot, Gray Leaf Mold, Septoria Leaf Spot, Xanthomonas, Cercospora, Pseudomonoas, Erwinia, Alternaria, Cercospora Leaf Blight, Botrytis Blight, Phytophthora Dieback, Powdery Mildew, Pestalotia Leaf Spot, Entomosporium Maculata, Colletotrichum sp., Algal Leaf Spot, Botrytis Leaf Rot, Flower Rot, Volutella Leaf Blight, Fire Blight, Fungal Leaf Spot, Scab, Exoporium Leaf Spot, Phytophthora Bud Rot, Black Spot, and Downy Mildew. CuPRO 2005 TNO was replaced with this CuPRO 5000. I used to use Kocide 2000 before I switched to this one. This one has slightly more of the same ingredient and I calculated the price for 15 pounds of this with the Kocide and the price difference was very small. So I tried this one out. The few percentage more of the copper hydroxide makes a significant difference. While Kocide was good, this works so much better. A few extra dollars for a massive increase in effectiveness is why I now use and support CuPro 5000. Very good and powerful fungicide. Works quickly and is at a great price. Good cost effective, wide spectrum contact fungicide. Label dosing was mostly per acre and hard to determine amount per gallon for particular diseases, but a similar product's label was clearer and I converted from there. I have used for fungus treatment for my tree farm. It provides cost effective fungus control.